Hyundai has released it's concept for a "walking car" called Elevate. It would be able to climb a five foot wall and step over a five foot gap. The concept was developed for use in the wake of a natural disaster. First responders could drive directly to victims instead of navigating debris on foot. The Elevate could also pick up people with disabilities at door level. Hyundai sees this as "the future of vehicular mobility". But for the time being it's just a concept. Hyundai introduced Americans to the Elevate, a walking concept vehicle with four robotic, bendable legs and a look made for the movies. 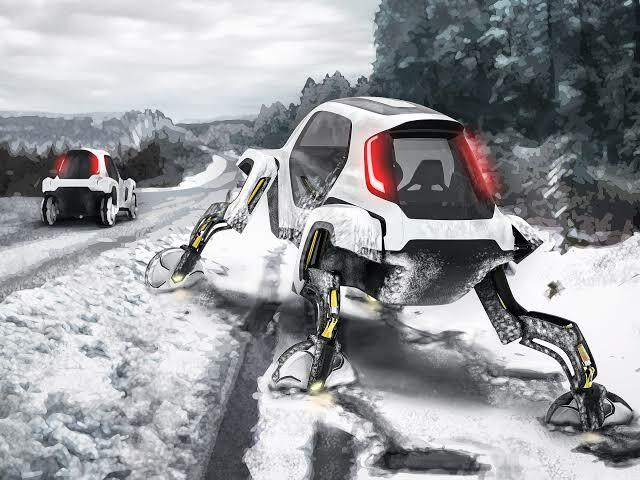 Going well beyond emergency situations the Hyundai Elevate Concept uses wheels with robotic legs allowing users to drive, walk, or even climb over the most treacherous of terrains. The mock-up design of the Elevate as well as it's intended purpose to rapidly respond to natural disasters and humanitarian crises are impressive. Elevate can drive to the scene and climb right over flood debris or crumbled concrete. It could walk up to their front door, level itself, and allow their wheelchair to roll right in , such continued "The Limitless Possibilities." Called the Elevate, this futuristic vehicle—which is entirely hypothetical at this point, mind you—has four wheels mounted on robotic legs that can move around in all sorts of different configurations to traverse essentially any terrain you can imagine. while in Mammalian walking mode it's more like a dog, with the legs articulating beneath the car's body. An Omnidirectional walking mode combines both walking techniques to adapt to different kinds of terrain. The Elevate can also apparently do crazy things—again, theoretically—such as scale a five-foot vertical wall and step over a five-foot gap.